Well done to NRL Victoria club Warrnambool Raiders who are in the 2018 Limestone Coast Rugby League Grand Final this Saturday 15th December. They are taking on the Naracoorte Jets at 3pm at Hughes Oval, Deakin University in Warrnambool. In last weekends Semi Finals, the Raiders prevailed over the Blue Lake Knights 36 - 16 to book their place in the big dance. In the other Semi, Naracoorte overcame the other Warrnambool based NRLVIC club, the Gunditjmara Bulls 42 - 10, setting up the highly anticipated Grand Final this Saturday between the Raiders and Jets. It was Gunditjmara Bulls inaugural season so it was a terrififc result for them to progress to the Semi Finals this year. 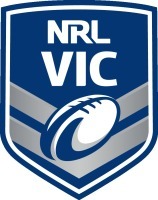 Our other NRLVIC club Horsham Panthers unfortunately missed out on the finals this season, however have had a good season and are building towards a bigger year in 2019. 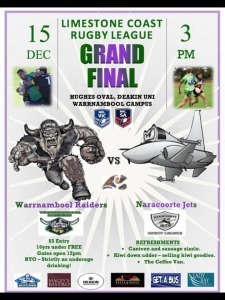 All the best to the Warrnambool Raiders this weekend!! !